Description: The Brill is a very large, broad bodied, left-eyed flatfish. The dorsal fin starts just above the large curved mouth. The first few rays of the dorsal fin are not entirely connected by the fin membrane, giving it a rather frilly appearance. The lateral line is strongly curved in hte region of the pectoral fin. It is usually sandy brown in colour with lighter and darker flecks and spots, however the spots are absent from the tail fin. The underside is creamy-white. 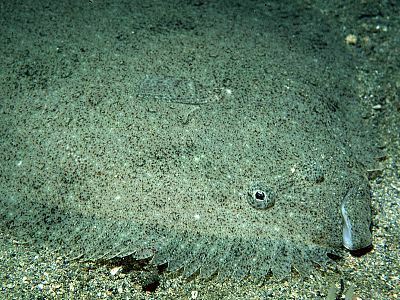 Like many flatfish the brill is capable of camouflage and can change its colour to match that of the seabed. Adult fish can grow to 75cm in length although most are less than 50cm. Habitat: This species usually lives on sandy seabeds but is sometimes encountered on gravel or mud. Juvenile fish only a few centimetres in length are often seen by people paddling by the water's edge or in rockpools on the low shore. Distribution: Widespread all around the coasts of Britain and Ireland although it is more common in the south. Similar Species: The brill is sometimes confused with the turbot (Scophthalmus maximus) however the latter has no frilly edge at the front of the dorsal fin. Picton, B.E. & Morrow, C.C. (2016). Scophthalmus rhombus (Linnaeus, 1758). [In] Encyclopedia of Marine Life of Britain and Ireland.